Earlier this month, the Horry County (SC) Council unanimously voted to permanently halt development along the proposed path of the Carolina Bays Parkway (SC 31). The ban will affect 177 lots in the Osprey subdivision in Socastee. The County will be required to pay fair market value for the land. When the Carolina Bays Parkway was originally proposed and later built, the section through Socastee from SC 544 to SC 707 was not completely funded. As a result, the land was not purchased by the county and the land was purchased for real estate development. The Osprey development is the only residential area either built or proposed in the highway's path. After Horry County residents passed a one cent transportation sales tax last fall, the county now has the funds to complete the parkway. The County will also receive funds for the highway from South Carolina's Infrastructure Bank. Last Saturday, I took a road trip out to the Outer Banks. I wanted to get the last three counties in Northeastern NC I need along with picking up some missing highway ends. The main reason for the trip was to go hiking at Jockey's Ridge State Park in Nags Head. The Route: NC 50, I-85, US 158, US 158 Bypass, I-85, US 158, US 301, NC 186, NC 305, NC 561, NC 45, NC 461, local secondaries, NC 45, US 158, NC 137, NC 37, US 17, NC 344, US 17, US 158, NC 136, US 158, US 64, I-540, local roads to home. Accomplishments: Added Hertford, Gates, and Currituck Counties. Clinched NC 136 and 137 in addition to new mileage on numerous highways: US 158, NC 305, NC 561, NC 45, NC 461, NC 37, NC 344, and US 64. The SC House has recently passed a reform bill on SCDOT by a 104-3 margin. The bill moves to the Senate where the bill could possibly stall. The push to reform SCDOT is a result of an agency audit that showed mismanagement of over $50 million in funds and also testimony that two DOT employees were ordered to hide cash balances. As a result of the audit and inquiry; last December, then SCDOT Executive Elizabeth Mabry resigned. Although the bill passed the House nearly unanimously, there were some reservations. Most of the reservations came from how the members of the Highway commission would be seated. Under the bill, there would be seven commissioners - one for each highway engineering district. The commissioner candidates would have to go through a screening panel and then elected by a joint session of the legislature. Currently, there are six commissioners - determined by US Congressional Districts - elected by lawmakers within their districts, and there is not a screening panel. Work will continue this summer on a four and a half mile stretch of Interstate 88 where two truckers died last spring. The work was to have been completed last year, but emergency circumstances prevented the completion of the reconstruction. The work should begin in April and be finished sometime in the summer. I don't believe this is related to the washed out culvert and flood. If I am not mistaken, this is the completion of a highway rehab project that started last year. The United States Marine Corps will officially close NC 172 through Camp Lejeune to the general public on Monday, April 2. The question now is will NC 172 be decommissioned? In the midst of moving back to NC and the Christmas holiday, I missed this news story out of South Carolina. This past December, SCDOT Executive Director Elizabeth (Betty) Mabry resigned in the face of increasing pressure from an audit of the organization. The audit which was released in November showed that SCDOT wasted over $50 million dollars over a three year period (2002-2005). The heat on Mabry was turned up a few notches as a result of the audit. The loudest calls for her resignation came from the Transportation Commission Chairperson, Tee Hooper. Hooper had been calling for her resignation since March 2005. His complaints of mismanagement of funds and lowering the agency's morale in February 2005 led to the audit of the agency. Part of his complaint also included a claim that Mabry passed up on the chance to receive $145 million in federal funding. Sneads Ferry, NC -- the small New River Inlet Village that will see the most impact from the US Marine Corps' decision to close NC 172 -- suffered another transportation blow when a bridge on nearby NC 210 will be closed by NCDOT for repairs. NC 210 is the main route into Sneads Ferry from either US 17 and Jacksonville or from NC 172. The bridge repairs are to begin this October. Many residents are concerned about the impact of the two road closures isolating their town. "Most people I know are more concerned with the closure of (N.C.) 210 than they are of (N.C) 172," said Sneads Ferry Community Council chairman John Uhrick. The bridge replacement is expected to take six to seven months. The state was unable to gain environmental clearance for a temporary crossing, so for three months NC 210 will need to be closed. The remainder of the construction traffic using the new bridge will be restricted to an alternating single lane. I located another article today about St. John's Church and the upcoming removal of the stairs and found some unique facts about it. The first North Carolina Version of the Local Sign Find was found on Old Creedmoor Road (Former NC 50) in Wake County. A black on white "Rogers Store" sign. 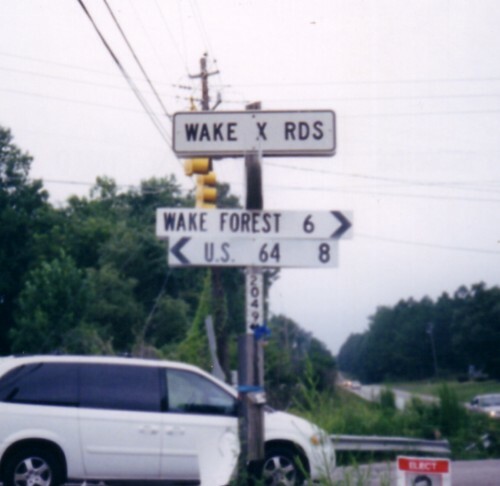 With the removal of a similar sign for Wake Crossroads, could this be the last black and white location sign left in Wake County? Rogers Store was settled prior to 1840. It received its name after Colonel Ransome Rogers who was the community's first storekeeper. The discovery of the endangered Carolina Heelsplitter mussel in Six Mile Creek may delay the start of an NC 16 widening project south of Charlotte. Currently, the widening of NC 16 from I-485 south towards Weddington is scheduled to begin in January 2008. As the start of restrictions for NC 172 through Camp Lejeune draws near, more details about the restrictions and reasoning behind it begin to emerge. First, once restrictions begin access to the highway through the base will be limited to those that have a Department of Defense Permit on their windshield. Permit stickers like these are commonly used for access to restricted areas of other military bases nationwide. The gate is schedule to close on April 2, 2007. Note: This date could be pushed back. About 1900 civilian motorists would be affected by this change and be required to use the US 17/NC 24 detour. In an earlier article, I mentioned an agreement in 1946 pretty much allows the base to restrict access at will over the highway. Well, more detail has come out about that. the Marines pretty much own NC 172 through base property. The nearly 70-year old Pennsylvania Turnpike has many quirks that you can't find on a modern freeway today. Large motorist pulloffs, numerous tunnels, a service plaza with a tunnel underneath the highway are some of the unique features that add to the Turnpike's lure. However, one unique piece that has been a special spiritual gem for many motorists will soon be removed. The two sets of steps that allow motorists to access St. John the Baptist Catholic Church in New Baltimore will be removed by 2009 in a Turnpike upgrading and widening project. The steps to the church were part of what is now believed to be a verbal agreement between the Church and the Turnpike in the late 1930s. In exchange for church land, the Turnpike built two sets of stairs -- one on each side of the highway -- to allow motorists access to the Church. For over 65 years, countless travelers -- including myself -- have stopped for mass or just to look around out of curiosity. Nothing news breaking but two unique perspectives of the probable closing of the highway through Camp Lejeune. Wilmington Morning Star Editorial - Closing NC 172 a blow to goodwill between the Marines and the general public. WECT TV 6 - Examines how much longer the Jacksonville route actually is. Includes video. Could NC 172 be Decommissioned?